After last year’s well-received debut, the Hymns of Love and Spirit EP, The Wilderness of Manitoba made their way back to their home basement studio to record a follow-up, and the results are similar to the quiet contemplation of their first effort. On When You Left the Fire, released independently last month, the band’s musical chemistry is tightened, exploring more vocal layering and augmenting the percussion, but the same deep, dark lyrical imagery that defined the first recording remains intact and again anchors this band firmly to the ground. When You Left the Fire is filled with the same sense of loss as the first EP—the heavy parts that make your brain feel as slow and spacey as the quietly lush folk Wilderness of Manitoba lay claim to. The first two minutes of album opener “Orono Park” will do nothing to change the harmonic Fleet Foxes vibes that have been oozing out of this band since day one, but as the track progresses and the male-female vocal interplay and the subtle stomping bluegrass rhythm take centre stage, Wilderness of Manitoba tap into a sound easily familiar, yet distinctly them—a perfect example of the whole becoming more than the sum of its parts. On “Summer Fires” (streaming above), the band sounds fuller than ever while exhibiting remarkable restraint, cultivating an intensity you wouldn’t expect in music this soft and unassuming. 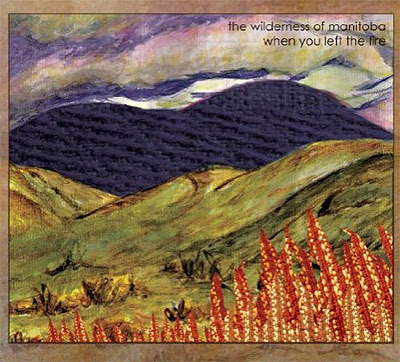 What’s perhaps most intriguing about Wilderness of Manitoba is again the unease and difficulty in an otherwise really familiar musical scope; accessible but challenging, familiar but uncomfortable, When You Left the Fire is a compelling sophomore album that forces close listeners to take pause and dig for their reward.